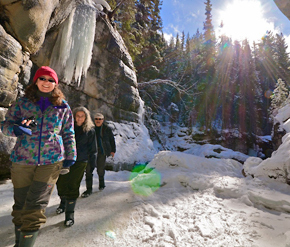 The Lake Louise area of the Canadian Rockies is full of things to do. Between the town, the lake, the surroundings of Banff National Park, and nearby Japser National Park, a vacation could go on forever, if only we had the time. 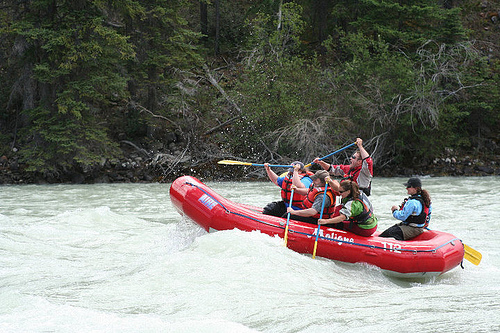 To help you organize your vacation, here’s a couple quick ideas of what to do in the Lake Louise area during the summer months. The Canadian Rockies and Lake Louise always deliver beautiful vacations. June marks the longest days of the year in Lake Louise, so stay up late and take a nature walk along the Bow River Loop. 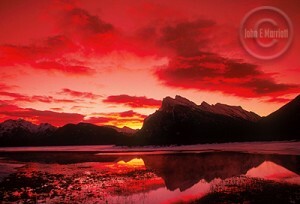 The sun can be up as late as midnight so take advantage of the quite summer nights in the Canadian Rockies. Mountain bike on over to the Great Divide picnic area by using the #1A Great Divide Highway from Lake Louise. As of 1999, this highway is car-free and only used as a paved bike path. It is about a six kilometer bike ride to the picnic area. Tips for non cyclers – you can still reach this area by motorized vehicle. Take the Trans-Canada (#1) west of Lake Louise for ten minutes and turn left to join the #1A (also the turnoff for Lake O’Hara). Paddle across beautiful Moraine Lake in a rented canoe. Moraine Lake is the first site of an aquatic restoration project in Banff National Park so you can see biologists and scientists removing invasive species to reintroduce the endangered bull trout. Walk along the Rockpile Trail to the canoe rental station located on the right. 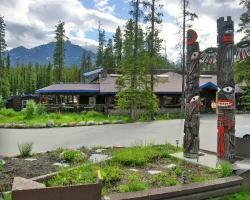 Go to an evening show at the Lake Louise Campgrounds or the Kicking Horse Campground in Yoho National Park. Parks Canada offers interpretive shows about wildlife and the history of the parks. Admission is free. 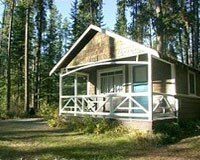 Have a quiet picnic at the Corral Creek picnic area located about ten minutes from Lake Louise on the #1A Bow Creek Parkway. You can have a fire and there are open grassy areas for family games. Take a short walk to McNair Pond to observe the ducks. Enjoy the flowers along Moraine Lake Road. Usually you would have to hike to see the show, but you can drive this road and stop at all the pull outs to see and smell the wildflowers. Sketch as many flowers as you can and identify them at the visitor centre. Please don’t pick any of the flowers since some of them are endangered species. Catch a baseball game at the Lake Louise Recreation Centre diamonds. The local leagues play on weeknights for most of the summer. Catch nine innings in the midst of great Canadian Rockies scenery with Mt. Temple looming in the background. View the Wapta Falls in Yoho National Park. In August, the glaciers are melting rapidly and the falls are in full force. You can view the falls from an easy walk to the overlook, but the real fun starts as you walk the trail that descends closer to the falls. Take a swim in Herbert Lake on a steamy summer day. The waters of Lake Louise are glacier fed, therefore really, really cold for swimming (although some brave locals do occasionally swim in the frigid waters.) Instead head to Herbert Lake for a swim; just make sure you go on the hottest day you can!